The Oksana antique brass 5 light chandelier with crystal drops, an opulent chandelier, with large faceted crystal droplets adding a touch of glamour. 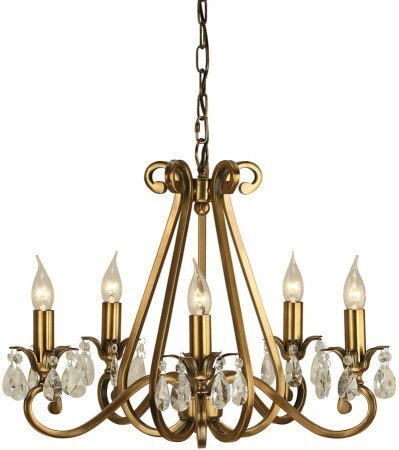 A magnificent antique brass plated 5 light chandelier with scroll arms and masses of quality 24% lead crystal drops. Featuring a central caged frame, double curved lamp arms, decorative petal sconces and candle tubes. Each sconce is decorated with large faceted crystal drops that sparkle when illuminated. The Oksana antique brass 5 light chandelier with crystal drops, part of the New Classics collection, an interiors 1900 exclusive design that has previously won the lighting show best product award.